of the Syrian refugee aid group No Lost Generation. When the State Department wanted to create a base of college students to help advocate for the more than 4.5 million Syrian refugees displaced by civil war, officials didn't need to look far. A few blocks away, Elliott School students stepped up to launch the first college branch of an initiative called No Lost Generation. Junior Matthew Donovan, co-director of the GW group, spoke with GW Magazine in February about its work, coffee with diplomats and student appetite for change. No Lost Generation is a coalition of about 20 humanitarian and governmental groups, including the State Department, that have come together to provide protection, education and services to Syrian refugees. Last summer, State Department officials approached Edward "Skip" Gnehm, a professor at the Elliott School and a former ambassador to Kuwait, because they wanted to connect with student leaders at GW to further student engagement with the initiative. After two meetings with the State Department, my co-director [senior] Lucas Kuo and I ran with the idea to create No Lost Generation GWU. Our first priority was figuring out how to take the Syrian refugee crisis out of the news cycle and put it into action on campus. This is the largest migration crisis since World War II, and No Lost Generation comes from the idea that there will be a generation of young people who are expected to return to their country and lead. If they don't have an education, they can't do that. One of the ways we are helping is by partnering with an organization called Rumie, based in Toronto. Rumie loads tablets with expert-approved educational content that can be accessed offline, and it deploys those tablets to Syrian refugees around the world. Since we can't be on the ground, we support Rumie by researching basic arithmetic, science and other lessons in Arabic and English that then are vetted by their experts and loaded onto tablets. We also co-hosted a fundraiser for the United Nations High Commissioner for Refugees with the GW International Affairs Society, and attended a dinner at the Kuwaiti Embassy along with President [Steven] Knapp, Deputy Secretary of State Tony Blinken and the president of the Malala Fund, Meighan Stone. When you reach out and say, “We are the first collegiate population looking to help,” it is a huge draw, and people see it as an opportunity to expand their cause and their reach. What kinds of opportunities have come about as a result of starting the group? Lucas and I always say that since starting this, we find ourselves in places we didn't think we would be in 20 years. The State Department is right here, and the ability to meet with officers after work or grab coffee during the day is really unprecedented. I am one of 10 members who are also participating in the State Department's Virtual Student Foreign Service—usually it's a remote internship, but we've been able to work with them on a regular basis to build our organization and have speakers come to campus. We also had a working meeting with Sarah Mendelson, who is one of the five ambassadors to the U.S. Mission to the United Nations. Typically this kind of thing is a just a photo op, but this was a working meeting where she offered advice and we discussed possibilities for joint programming. Was there an appetite for this on campus? Absolutely. It became clear, very quickly, that there are so many students looking for an opportunity to get involved in a cause but have difficulty finding an outlet where they can see change happen. We've attracted 65 students in about three months, and every member completes a minimum of four hours of service each week, which totals more than 3,000 hours since September. Even though we started with mostly Elliott School students, our members now include computer engineers and curriculum developers. Right now we want to keep attracting volunteers at GW and finding partners. We are also reaching out to local universities and those across the country who might be interested in starting a No Lost Generation chapter on their campus. The goal is to create a collegiate network where GW is a hub and to host a conference here. If you're in Iowa or California, the State Department is pretty far away. 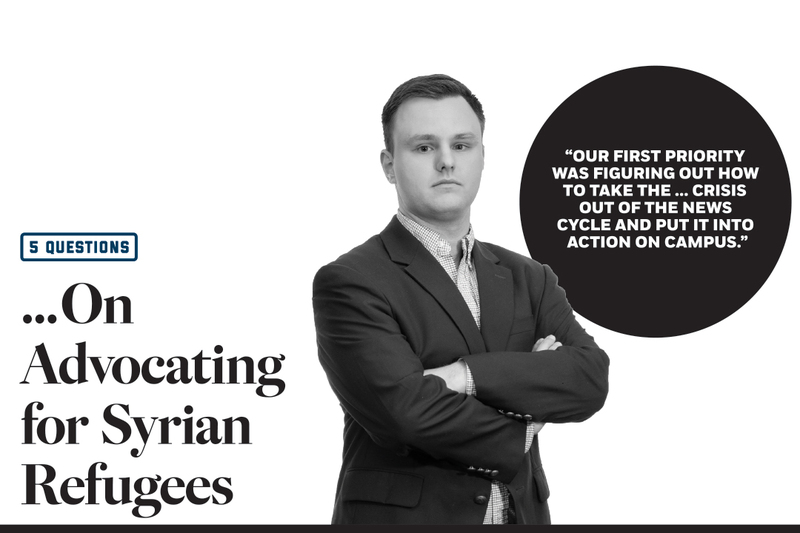 Since we have so many connections to federal agencies and organizations with national headquarters in D.C., a conference at GW would give others a more personal connection to people leading the response to the Syrian refugee crisis. We want to get as many people as possible working on this because there is so much potential and enthusiasm from everyone we've talked to.